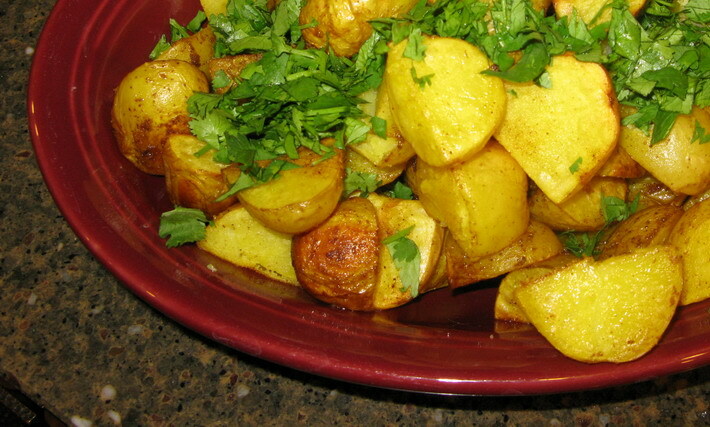 These potatoes are so simple to make, and they taste and look beautiful. This recipe started out with baby Carola potatoes. Carola is a German heirloom variety with thin, golden skin and creamy yellow flesh that has a slightly sweet, earthy flavor. Of course, you could use any kind of baby potatoes to make this dish–fingerlings or tiny Red Bliss, or Yukon Gold would be just fine. I made these potatoes to go with my traditional Fourth of July dinner, which consists of foods from elsewhere. In recognition that our country was founded by immigrants, and in support of my belief that what makes America strong and great the diversity of cultures which call this country home. This year, we had Indian food. Other years, we have had Thai food, Mexican food and Italian food. Next year, I have no idea what we will have to eat at our Fourth of July bash, but no doubt, it will be tasty, and I will likely do what I have always done–make a mix of traditional recipes and my own dishes inspired by the traditions of whatever cuisine we are cooking and eating at that time. 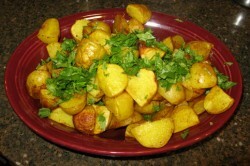 These roasted potatoes are not traditionally Indian. They are basically made the same way that potatoes are roasted in European traditions, but instead of drizzling them with olive oil, I used peanut oil, although melted ghee or canola oil would have worked. I also seasoned the oil with salt and my own house mixture of garam masala, which includes cloves, black peppercorns, cumin, cinnamon, black cardamom, dried cayenne chili and a bit of green cardamom. In order to boost the natural golden hue of the potatoes, I added about a quarter teaspoon of ground turmeric. And, after the potatoes were done, I sprinkled freshly chopped parsley over them as a garnish. If I would have had some Aleppo pepper flakes left, I would have used those as well to add sparkles of rosy red to the dish. Mint would have worked just as well, but I had more cilantro than mint in the garden, so that is what I used. These roasted potatoes would be great with roasted chicken or a leg of lamb. I also happen to think they would be great as part of a vegetarian Indian meal with mattar paneer, broccoli with panch phoron and bhindi masala. Mix together the oil (melt the ghee first if you use it), salt, garam masala and turmeric, and drizzle over the potatoes. Toss potatoes gently to coat. Bake in preheated oven for thirty minutes. Stir potatoes after thirty minutes and return to oven to bake until the outside of potatoes are crispy and the inside is tender. Sprinkle with cilantro, mint or scallions and Aleppo pepper flakes for garnish and serve immediately, while still hot. The potatoes looked very tasty. I especially liked the sprinkle of parsley over the top since I’m one of those people who can’t abide the taste of cilantro. I like your idea of celebrating the past of the country by choosing various dishes. I love the symbolism of your Fourth of July meal. The recipe sounds tasty as well. I might give it a try tonight with some fingerling potatoes. I like the idea of cooking different food every year…. and the potatoes indeed look yummy!!! will definitely try the recipe..
Yum. I also do a very similar thing with carrots and winter squash. I bought some garam marsala and wanted to do something with it a month ago, but never got around to it. I’ll have to make this soon.